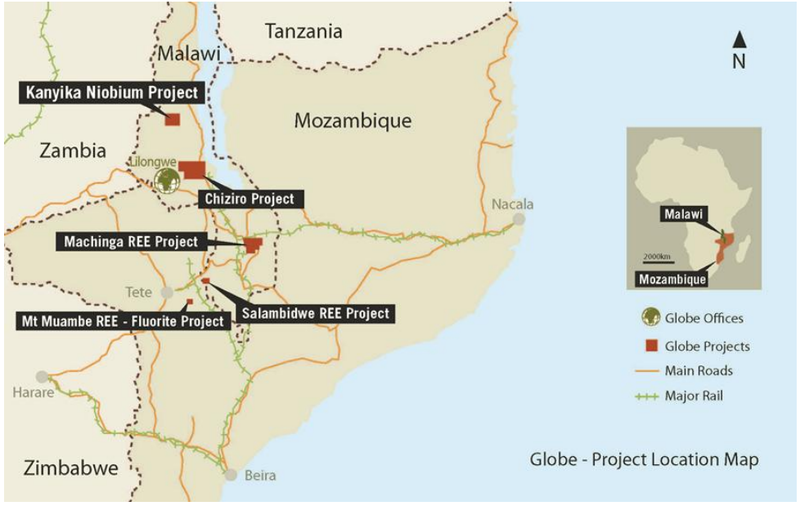 Globe Metals & Mining is yet to sign Mining Development Agreement with the Government of Malawi, necessary to finalise the Definitive Feasibility Study that will influence whether or not the Board gives the go-ahead on the Kanyika Niobium Project. Although this may be hold, this week, the company announced that East China Mineral Exploration and Development Bureau (ECE) will undertake and fund exploration activities under Globe’s Exclusive Prospecting Licenses in Malawi. ECE, established in 1955 with international experience in mining exploration since 2007, will substantially fund all exploration activity at the Kanyika Niobium Project, Chiziro Graphite Project, Machinga REE Project and the Salambidwe REE Project. The Memorandum of Understanding signed between Globe and ECE will be in effect until 31 December 2013, with the possibility to extend for another 12 months. During this time, Globe will maintain control of all exploration activities, supervision, budgets and schedules, and ECE will provide up to 10 staff to be based on-site and begin work in May. As Globe’s major shareholder, ECE has again proven its support to the Company through the signing of this binding MOU, which leverages ECE’s internal technical capability. ECE has more than 50 years’ experience and is well respected in the resource industry, operating dozens of exploration and mining projects worldwide. The funding and technical support from ECE provides a non-dilutive mechanism to increase value across the project portfolio and removes a large portion of the exploration risk. We believe the collaboration of the Globe and ECE exploration teams will boost our ability to discover more resources in Africa and strengthen the Company’s asset portfolio and long-term outlook. Globe will reimburse ECE for exploration expenditure related to each project in the event of ECE outlining a Joint Ore Resource Committee compliant resource which leads to the commissioning of a Pre-Feasibility Study or when income is generated from the project. Reimbursement will be based on costs accrued by ECE during exploration, with no premium for identified resources. At Kanyika, exploration will focus on regional mineralised targets, outside of those resources which are currently subject to assessment in a Definitive Feasibility Study. See Globe Metals & Mining ASX Media Announcement here.